Say NO to zero G! Hello, and a special welcome to those of you who joined my monthly mailing list/newsletter at my book signing and talk to the NASA Alumni League at JSC on November 5. I call it Science Snacks because I discuss one cool science fact or news item (the “snack”) in each issue that I hope writers and readers of science fact & fiction will enjoy. This month’s topic is freefall. 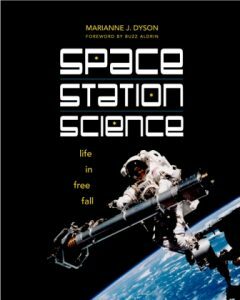 Since Space Station Science: Life in Freefall, was originally published in 1999, I have spoken to tens of thousands of students. When I toss a ball up in the air and ask why it falls down, the students have no problem answering that gravity pulls it down. Then I ask why the space station stays in orbit, and always someone shouts that it is because there is no gravity in space. I then ask them to raise their hands if they think there is no gravity in space. When I first started speaking at schools, about half the hands would go up. The rest admitted they didn’t know. Now almost all the hands shoot up, even those of the teachers. The force of gravity at the Earth’s surface is 1g=GMm/D² where M is Earth’s mass, m is your mass, and D is 4000 miles, the radius of Earth. If you divide gravity at the surface by gravity 200 miles above the surface, all the terms cancel out except for D². So 4000 x 4000 divided by 4200 x 4200= 16,000,000/17,640,000 or 0.90. Thus, a person on a platform 200 miles up weighs 90 percent of what they weigh on the surface. Why then, do astronauts float in space? The answer: because they are falling! To demonstrate this at schools, I hold my space duck out beside me and ask the kids to imagine that we are skydiving. We step out of the plane together. Gravity immediately pulls us down. We appear to be floating next to each other as we fall at the same rate. Things float in space because they are falling. But unless we deploy our parachutes, we will hit the ground. (I address the misconception that heavy things fall faster by dropping two plastic containers, one empty and one full of coins and letting them see they hit at the same time. I explain that falling in air depends on shape, not mass. I reference the Apollo 15 demo of the feather and hammer and note that their shapes didn’t matter because there is no air on the Moon. So if the space station is falling, whether in air or not, why doesn’t it hit the ground? To demonstrate the answer, I have a little toy sponge shuttle on a string. I toss it up and it falls back down, gravity is pulling it down. Then I spin it around in a circle and say that gravity is like the string. As long as the space ship is high enough that it won’t run into anything (including air that slows it down) and continues going fast enough (about 5 miles a second), it can balance gravity. But if it slows down, it falls to the ground. That’s how we return from space: we slow down by firing engines and using friction with the air (and our shape to increase that friction). Thursday, November 12, I’m speaking at Bethany Elementary in Plano, Texas. If there is a particular science topic you’d like me to address in a future Science Snacks, please send me an email. Note, you can order copies of my books via my website. Hello, and a special welcome to those of you who joined my monthly mailing list/newsletter at the Freeman Library Book Fair and at the SCBWI Houston meeting December 5th and 7th. I call it Science Snacks because I discuss one cool science fact or news item (the “snack”) in each issue that I hope writers and readers of science fact & fiction will enjoy. 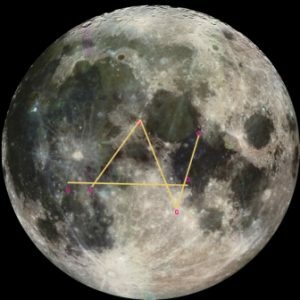 This month’s topic is observing the Moon. The Apollo Program “gave” me the Moon, and with it, a longing to explore space. 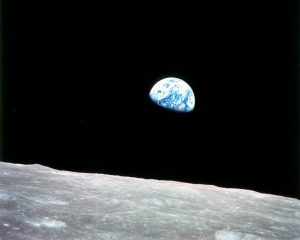 I’m ever grateful for this gift which I first “opened” on Christmas Eve in 1968 when Apollo 8, the first human ship to orbit the Moon, sent back the famous image called “Earthrise,” showing the fragile blue home planet with the Moon’s stark surface in the foreground. During the following four years, six Apollo missions landed on that surface, forever changing what I see when I view a full Moon now: the places where they landed. This year, we are all given the gift of a full Moon on Christmas. I urge you to go out and “unwrap” this gift. Using the simple memory aide I created as an activity for Odyssey magazine years ago, you can “open” this gift with the knowledge of where the Apollo missions landed (and impress all your relatives!). Grab a friend or family member and go outside after dark on Christmas Eve or Christmas Day. The Moon will rise in the east around sunset and be overhead at midnight. First, identify the major features which are the dark maria or “seas.” For naked eye US observers, a very round dark spot on the right edge (which may point “down” at sunset) is the Sea of Crisis near the eastern equator. The left or western side of the Moon is generally dark (the Ocean of Storms). The left “eye” is called the Sea of Rains and beside it is the Sea of Serenity which is somewhat smaller. To the right and south and about the same size as Serenity is the famous Sea of Tranquility, where Apollo 11 landed. Use your imagination to think of Serenity as the body, and Tranquility as the head of an upside-down “peace sign” rabbit, with two dark “finger ears” (Sea of Nectar and Sea of Fertility) pointing south. Apollo 11 landed near the equator right about where the Sea of Nectar connects. Next note the bright white spot below the Sea of Rains. This is the crater Copernicus. Apollo’s 12 and 14 are south of it on either side and near the equator. In your mind, draw a line from 11 to 12 and 14. (Note, Apollo 13 didn’t make it to the Moon, but you can download the movie!) This is your “baseline” equator. Next draw a line from 14 up to a point between the eyes of Rains and Serenity. This is the bridge of the Moon’s nose and marks where Apollo 15 landed. Now draw a line from Apollo 15 to below the equator in the whiter highland area across from the “kink” in the rabbit’s ear (Nectar). This is the site of Apollo 16. Finally, draw a line from there, past Apollo 11, up to the “top” side of the “neck” between the body (Serenity) and head (Tranquility) of the rabbit where Apollo 17 landed. You have now connected the dots of all the Apollo landing sites in order from Apollo 11 to 17 and drawn a letter “N” for nose on the Moon! My son created an animated Moon Map for my website which includes this activity and also information on the features named. I hope you will enjoy “opening” and sharing this celestial gift with your friends and family this holiday season. Happy New Year to everyone! The index for my memoir, A Passion for Space, has been updated with the correct page numbers. The new index is available free via Springer. Copies purchased after November have the updated index. The book is available via Springer and Amazon. My short story, “The Right of Interference,” is included in the anthology, Touching the Face of the Cosmos: On the Intersection of Space Travel and Religion & is now available for order via Amazon. Saturday, December 19, 2015. Book signing with Buzz Aldrin, Kennedy Space Center Visitor Complex, Florida. Friday, February 19, 2016. Featured speaker for “Dinner with a Slice of History,” International Women in Air & Space Museum, Cleveland, Ohio. Book sales benefit the museum. Communications Failure in The Martian Realistic? 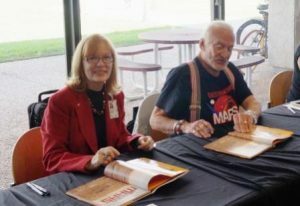 Hello, and a special welcome to those of you joined my monthly mailing list/newsletter at the book signing with Buzz Aldrin at JSC on October 2. I call it Science Snacks because I discuss one cool science fact or news item (the “snack”) in each issue that I think other writers and readers of science fact & fiction will enjoy. The loss of communications plays a critical role in The Martian. 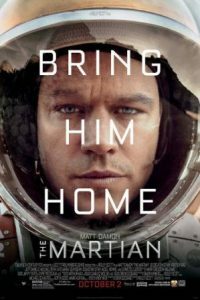 As someone who loves to poke holes in movie “science,” I had to ask myself, is it a viable premise that Mark Watney is left with no way to communicate with Earth? Well, not really given that no Martian dust storm would ever have winds strong enough to knock out the primary antenna which author Andy Weir says, “acted like a parachute, getting torn from its foundation and carried with the torrent.” It also wouldn’t be buried in sand which (you geologists correct me if I’m wrong) is too heavy to be picked up by Martian wind in such quantity. The wind is also insufficient to knock over the MAV, which, being critical hardware, would be designed with this in mind if it were true! But those of us who have worked real flights know that despite all our contingency plans, training, and malfunction procedures, things fail, explode, melt, freeze, or just plain refuse to function. And communications systems are notorious for finding creative new ways to not work. Shoot, even if the communications systems work, computers (also notoriously creative in failure modes) can keep them from delivering any meaningful data. Certainly no one anticipated the fire that took out the Mission Operations Computer during STS-5, severing all communications with the orbiter (at a time when the backup MOC was also down). If communications weren’t restored within about three hours, because of Columbia’s deteriorating state vector which required communications to update, the crew might have had to do an emergency landing in Africa. What, you never heard about this near-miss abort? You can blame that on communication failures, too. Public Affairs decided not to bother the news media until after the smoke cleared, literally. This aspect of communications is also reflected in The Martian when NASA decides not to release the data about Watney being alive until they have a rescue plan to offer. To restore communications, Watney (played by Matt Damon) treks to the Pathfinder site to retrieve its hardware. He first uses a Yes/No/? system and then devises a clever way for the camera to rotate in a circle marked off with the numbers 1-9 and letters A-F to represent the alphabet in hexadecimal code (41 is A, 5A is Z). Engineers back at JPL figure out what he’s up to and get the old Pathfinder out of storage. During the STS-5 fire, we created our own version of the Yes/No/? communications using the teleprinter, a single font, one-line-at-a-time teletype we flew on the early flights. Unlike voice and data, it didn’t require the MOC. We readied a one-way message to send the crew if necessary. The INCO team (led by Bob Castle) prepared an actual (just like the movie!) hexadecimal message that could be read up through one of the ground stations to have the crew manually clear the state vector alarm. 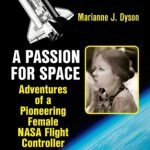 There’s more about the STS-5 fire in my memoir, A Passion for Space: Adventures of a Pioneering Female NASA Flight Controller which is now available in eBook and print from Springer and Amazon or through my website or at one of my events (see below).If you want to discuss other aspects of The Martian, please find me on Facebook! Thursday, November 5, 2:30-4 PM, JSC Gilruth Center, Lone Star Room (2nd floor), Houston, 77058, Discussion of A Passion for Space. If there is a particular science topic you’d like me to address in a future Science Snacks, please send me an email. Note, you can order copies of my books via Amazon or autographed copies via my website. Hello, and welcome to Science Snacks! This occasional newsletter is where I discuss one cool science fact or news item (the “snack”) in each issue that I think other writers and readers of science fact & fiction will enjoy. I will also announce new publications & appearances where I hope to meet subscribers! I hope you agree that learning new things is a treat! When talking with the public, and especially kids, providing facts is not enough. For example, telling kids that Mars is never closer than 50 million miles from Earth doesn’t really explain the distance to them. How far is that? 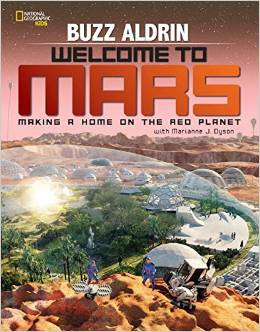 In the book, Welcome to Mars which I coauthored with Buzz Aldrin, I tell them it’s equal to about 10,000 trips around the Earth. This is helpful for adults and older kids. But for those who have never traveled beyond their home towns, the scale of the Earth is about as meaningful as 50 million miles. How else can we express distance? Since it takes time to cover distance, kids intuitively understand that it takes longer to walk across a football field than a tennis court. They also understand that if they ride a bike, they can cover that distance faster than by walking. So I add that even at rocket speeds, it takes about six months to get to Mars. While facts and analogies are helpful, many kids (and adults!) benefit from the reinforcement of hands-on activities to actually absorb a new science concept like how orbits work. So an activity on pages 18-19 has them build a “race track” that shows the relationship of the orbits of Earth and Mars around the sun and how their distances vary in a periodic cycle. Buzz wants people not to just go to Mars, but to stay there and turn it into a new home for humanity. Getting kids to think of Mars as another country that takes a long time to get to because of the way it moves around the sun, will help them understand what kind of commitment in time and resources it will take to settle Mars. If there is a particular science topic you’d like me to address in a future Science Snacks, please send me an email! Note, you can order copies of my books via my website.